Jerry Griswold, Director of the National Center for the Study of Children's Literature, once wrote a wonderful book length essay about some of the pervasive qualities of childhood that recur as themes in children's stories. One of these qualities he deemed "snugness," the desire of children for a small, snug, safe place of their own, like a treehouse, a fort carved out of the shrubbery, or a hideout made under a folding table draped with a sheet. He noted the prevalence of places like these in children's literature, particularly the cozy homes of Mole and Badger in The Wind in the Willows, and the dollhouse in Beatrix Potter's classic The Tale of Two Bad Mice. Of such small playhouses he said, "What lies behind this miniaturization and the vision of enclosed space is a wish to make life more manageable, a wish for control." I think his thesis on the importance of small, snug playspaces can be extended to children's toys too, as there are countless examples which reflect this longing for a space of one's own, and enable children to have control over a tiny world and its inhabitants. 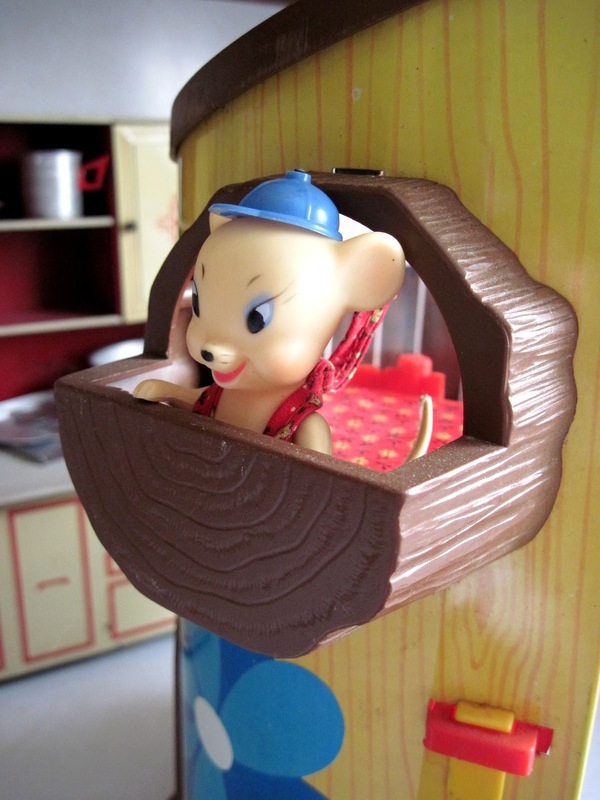 One of my favorite examples is the Elly and Andy Baby Mouse Tree House, made by Remco in 1967 as part of their T.V. Jones line. The 15 inch tall tree trunk house is made of lithographed tin with plastic details including a branch swing, front steps, windows, a balcony, and even a working elevator. Inside, the little house is divided into two rooms, a bedroom and dining area. Cheerful colors make the interior cozy and appealing. The furnishings include a hutch and dresser with a pull out drawer, an adorable mushroom table with tree stump chairs, and even a piece of cheese. 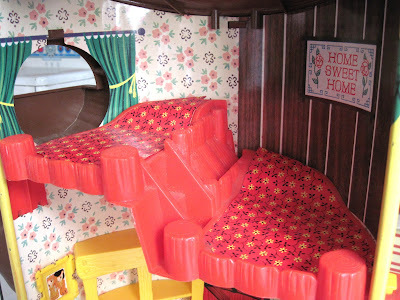 The chairs have little notches cut out in the back to accomodate the mouse tails, a thoughtful touch. Upstairs are two cozy loft beds, leading the way to an inviting balcony. You always have the most interesting finds; I've never seen this toy before. It's so cute. You're welcome! Glad you enjoyed seeing it! 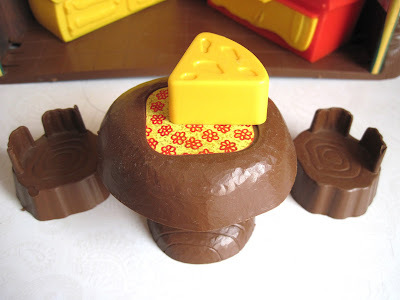 I had this as a child. Would love to have one agine. I had one as a child, and now I've collected the mouse house, the treehouse and two sets of parents but I can't find the twins! Tracy, I have two photos of myself from Christmas of 1967, the year I received my Mouse Tree House. 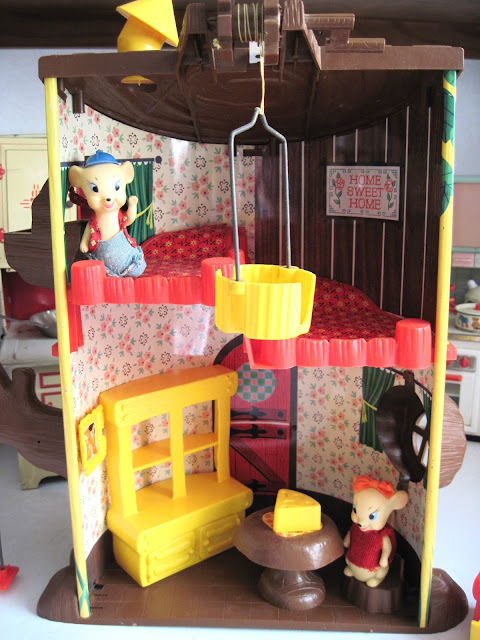 I am a scrapbooker, and would like to do some scrapbook pages of my photos and memories of this toy. 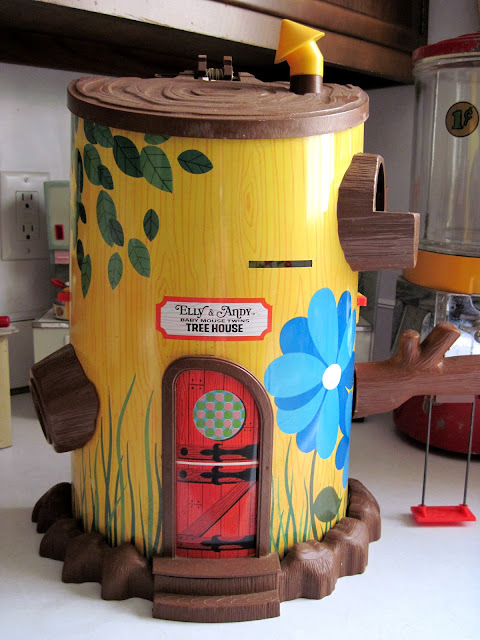 It would be awesome if I could use, with you permission, the very detailed photos you posted here on your blog of the Mouse Tree House since I no longer own this toy. I would give a credit line on my page to you, as sometimes I post my pages on the scrapbooking site Two Peas In a Bucket, not for profit but just to share with the scrapbooking community. Please let me know if you would be willing to allow me to do this. You can e-mail me directly at nancylubrano@gmail.com. I would love to show you my photos from when I was 5 and Santa brought me this amazing toy! You are very welcome to use these photos for your scrapbooking: thanks for asking first! I'd love to see your 1967 photos: I've emailed you privately. Hello, Tracy. 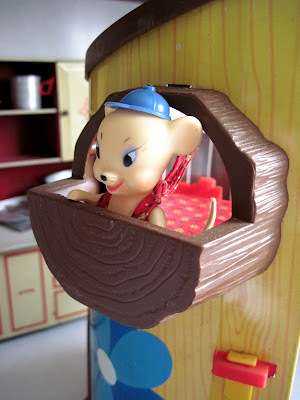 I've been hunting for this mouse house to replace the one I adored as a child. My mother threw it out when I was at school one day. Here I am, 40 years later, still searching for a replacement. Wonder what Professor Griswold would have to say about that! Any way, if you are ever interested in selling your mouse house, I would appreciate it if you let me know. I'm afraid I'm very fond of my mouse house and not willing to sell it yet, but if I decide to, I will definitely keep you in mind. I hope you find one in the meantime: they do turn up on eBay sometimes. Good luck! there's a mouse house on etsy. it's almost as nice as the one here. Wow: I just looked, and that one has the box! I may have to snap it up myself...I'm a sucker for original boxes. I just snapped it. Thanks for the heads-up! I bought one of these deluxe sets about ten years ago at an auction -It was in with a box of other stuff that they always put out at the end of the night. I think it was like a $2 box! I didn't pay much attention to it but researched it a couple years later and saw it was valuable -then looked inside the box and it was mint and complete and, although the box was somewhat distressed it went for about $250 on FeeBay. Now I wish I still had it because it is a really cool piece. Wow: that was quite a find! Congrats! I remember my Mouse House very fondly. I was surprised to find I still have several components of it (very unusual as I have almost nothing from my childhood). However, mine also came with a mom mouse and a dad mouse. (I have no idea where they slept!) They, the grown-ups at least, were dressed in some sort of red felt outfits, sort of like a nightshirt. 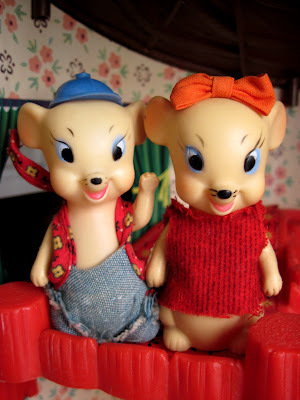 I'm pretty sure they came with my set because (if memory serves) their faces were similar to those of the young mice. I wish I still had the whole thing -- my "elevator" and swing were lost, and I am not sure if I have the furniture. I had completely forgotten about the bow on the young girl mouse's head -- if I remember right, you just pushed it straight into her head with a push-pin. LOL! Thanks for the picture; lots of good memories there! I just came across thia treehouse with both elly and andy only thing thats missing is the mushroom table. Anyone interested in purchasing? I am looking for Elly & Andy, I have the house and the treehouse with 2 sets of parents! I would love to purchase a Mouse Treehouse with Elly and Andy. That toy meant the world to me as a child. If anyone has one and is willing to sell I'll buy it right now. 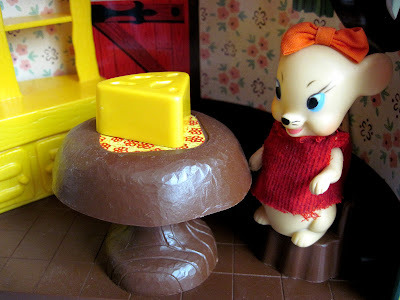 After months of looking and looking and hitting the D.C. Doll & vintage toy show twice, I paid an obscene amount for one on Ebay w/o any of the furnishings, mice, and the w/o the coveted cheese, 15 years ago. It was the first thing I wished my Mom had saved.It must be a fairly rare toy, or everyone destroyed there's too. The only thing I retained from childhood were two of the stump chairs, the top bunk level and the red swing. It was a favorite childhood toy and I can still recall the utter wonder in Santa's generosity I felt the morning I unwrapped it. Think I broke the elevator crank the first evening and my father had to constantly jury rig the branch with match sticks and tiny shims. The tails were the next to go teeth were involved -mine). The next elements to evaporate ere the bows and clothes, but my Mom in a rare show of maternal domesticity showed me how to make tissue paper dresses held together with rubber band belts and string. I believe there was and ear piercing episodes that went through a cheek and an an unintentional tattoo job with a blue Bick, which left me sobbing...and forever learning the word, indelible. When I received it after hoping one would surface on Ebay, and one finally did, I pounced and lovingly painted replacement wood furniture yellow like the original plastic ones, and toad stoles made of wood toy knobs and on scale ceramic platesand like my Dad stuck my own shims into the branch to hold it to the wall, and glued the shattered crank on the elevator. Priceless, my daughter also enjoyed it. I Think parents set was either an add on on possibly an earlier or later set, I have a vague recollection of them.